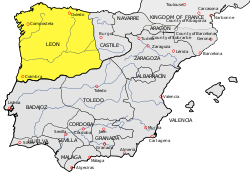 The Kingdom of León (yellow) in 1037. 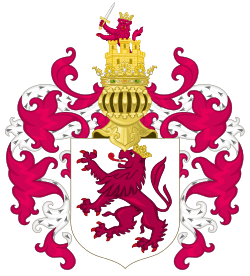 The Kingdom of León (Spanish: [leˈon]; Leonese: Reinu de Llïón, Spanish: Reino de León, Galician: Reino de León, Portuguese: Reino de Leão, Latin: Regnum Legionense) was an independent kingdom situated in the northwest region of the Iberian Peninsula. It was founded in AD 910 when the Christian princes of Asturias along the northern coast of the peninsula shifted their capital from Oviedo to the city of León. The County of Portugal separated to become the independent Kingdom of Portugal in 1139 and the eastern, inland part of León was joined to the Kingdom of Castile in 1230. From 1296 to 1301, the Kingdom of León was again independent and after the re-union with Castile remained a kingdom until 1833, but as part of a united Spain from 1479. In the Royal Decree of 30 November 1833, the Kingdom of León was considered one of the Spanish regions and divided into the provinces of León, Zamora and Salamanca. In 1978, these three provinces of the region of León were included along with six provinces of the historic region of Old Castile to create the autonomous community of Castile and León. The city of León was founded by the Roman Seventh Legion (usually written as Legio Septima Gemina ("twin seventh legion"). It was the headquarters of that legion in the late empire and was a centre for trade in gold, which was mined at Las Médulas nearby. In 540, the city was conquered by the Arian Visigothic king Liuvigild, who did not harass the already well-established Roman Catholic population. In AD 717, León fell again, this time to the Moors. However, León was one of the first cities retaken during the Christian reconquest of the Iberian peninsula, and became part of the Kingdom of Asturias in AD 742. León was a small town during this time, but one of the few former Roman cities in the Kingdom of Asturias which still held significance (the surviving Roman walls bear the medieval walling upon them). During Visigothic times, the city had served as a bishopric, and incorporating the city into Asturias brought legitimacy to the Asturian monarchs who sought to lead a unified Iberian church, during a time when most of the Iberian Peninsula was governed by Muslim powers. Shield of Alfonso IX displayed in the Tumbo A manuscript of 12th century. The purple lion emblem displayed in the Tumbo A.
León was created as a separate kingdom when the Asturian king, Alfonso the Great, divided his realm among his three sons. León was inherited by García I (911–914). His successor was Ordoño II of León (914–924), who moved the capital of the kingdom of Astures to León. Ordoño II of León was also a military leader who brought military expeditions from León south to Seville, Córdoba, and Guadalajara, in the heart of the Muslim territory. After a few years of civil wars during the reign of Fruela II, Alfonso Fróilaz and Alfonso IV, Ramiro II (931–951) assumed the throne and brought stability to the kingdom. A brave military chief who defeated the Muslim armies in their own territory, Ramiro's expeditions turned the Valley of the Douro into a no-man's land that separated Christian kingdoms in the north of Iberia from the Muslim states in the south. Ramiro II was nicknamed "The Devil" by Muslims because of his great military skill. Spanish Christian kingdoms c.925: Castile was a Leonese county and Galicia was a dependent kingdom. As the Leonese troops advanced they were followed by a process of repoblación, which consisted of repopulating the Meseta high plains, with people coming from Galicia and especially from Asturias and León. This migration of Leonese peoples greatly influenced the Leonese language. During the repoblación period, there arose a distinct form of art known as Mozarabic art. 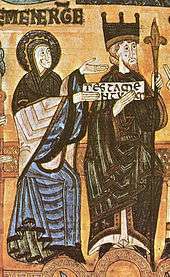 Mozarabic art is a mixing of Visigoth, Islamic, and Byzantine elements. Notable examples of the Mozarabic style are the Leonese churches of San Miguel de Escalada and Santiago de Peñalba. During the early 10th century, León expanded to the south and east, securing territory that became the County of Burgos. Fortified with numerous castles, Burgos remained within Leon until the 930s, at which time Count Ferdinand II of Castile began a campaign to expand Burgos and make it independent and hereditary. He took for himself the title Count of Castile, in reference to the many castles of the territory (around Burgos), and continued expanding his area at the expense of León by allying with the Caliphate of Córdoba, until AD 966, when he was defeated by Sancho I of León. The Kingdom of León continued to be the most important of all those of the Iberian Peninsula. However, Sancho III of Navarre (1004–1035) took over Castile in the 1020s, and added León in the last year of his life, leaving Galicia to temporary independence. In the division of lands which followed his death, his son Fernando succeeded to the county of Castile. Two years later, in 1037, he conquered León and Galicia. For nearly 30 years, until his death in 1065, he ruled over a combined kingdom of León-Castile as Ferdinand I of León. Early in its existence, León lay directly to the north of the powerful Caliphate of Córdoba. When internal dissensions divided Al-Andalus loyalties in the 11th century, leading to an age of smaller Taifa successor states of the Caliphate, the Christian kingdoms who had been sending tribute to the Caliphate found themselves in a position to demand payments (parias) instead, in return for favours to particular factions or as simple extortion. Thus, though scarcely influenced by the culture of the successor territories of the former Caliphate, Ferdinand I followed the example of the counts of Barcelona and the kings of Aragon and he became hugely wealthy from the parias of the Taifas. When he died in 1065, his territories and the parias were split among his three sons, of whom Alfonso emerged the victor in the classic fratricidal strife common to feudal successions. Few in Europe would have known of this immense new wealth in a kingdom so isolated that its bishops had virtually no contact with Rome, except that Ferdinand and his heirs (the kings of León and Castile) became the greatest benefactors of the Abbey of Cluny, where Abbot Hugh (died 1109) undertook construction of the huge third abbey church, the cynosure of every eye. The Way of Saint James called pilgrims from Western Europe to the supposed tomb of Saint James the Great in Santiago de Compostela, and the large hostels and churches along the route encouraged building in the Romanesque style. Alfonso VI was one of the most important kings of León of the Middle Ages. He assumed control of first León, and later Castile and Galicia, when his brother died attacking the Leonese city of Zamora. He was crowned Emperor of Spain and received the honoring of all the kings of the Iberian Peninsula. The taking of Toledo, the old Visigoth capital, in 1085 by Alfonso VI of León was a turning point in the development of León and Castile and the first major milestone in the Reconquista. Christian Mozarabs from Al-Andalus had come north to populate the deserted frontier lands, and the traditional view of Spanish history has been that they brought with them the remains of Visigothic and Classical culture, and a new ideology of Reconquista, a crusade against the Moors. Modern historians see the fall of Toledo as marking a basic change in relations with the Moorish south, turning from the simple extortion of annual tribute to outright territorial expansion. Alfonso VI was drawn into local politics by strife within Toledo and inherited the political alliances of the city-state. He found himself faced with problems unfamiliar to him, such as appointing and dealing with a Catholic bishop in Toledo and the settling of garrisons in the small Muslim strongholds, the taifas, which were dependent on Toledo and which often bought the king's favour with gold from their trade with Al-Andalus and the Maghreb. Alfonso VI thus found his role as a Catholic king redefined as he governed large cities with sophisticated urban, Muslim subjects and growing Christian populations. The two kingdoms of León and Castile were split in 1157, when a major defeat for Alfonso VII of Castile weakened the authority of Castile. The last two kings of an independent Kingdom of León (1157–1230) were Ferdinand II and Alfonso IX. Fernando II led León's conquest of Mérida, a city dating from Roman times. Alfonso IX, besides conquering the whole of Extremadura (including the cities of Cáceres and Badajoz), was the most modern king of his time, founding the University of Salamanca in 1212 and summoning in 1188 the first parliament with representation of the citizenry ever seen in Western Europe, the Cortes of León. Alfonso IX did not want his kingdom to disappear upon his death and designated his heirs as Sancha and Dulce, the daughters of his first wife. When Alfonso IX died in 1230, his son by Berenguela of Castile, Ferdinand III of Castile, invaded León and assumed the crown. He thus became the first joint sovereign of both kingdoms since the death of Alfonso VII in 1157. 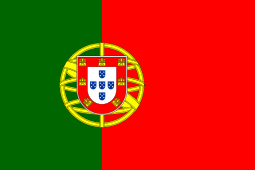 The isolated Atlantic province, the County of Portugal, separated to become the Kingdom of Portugal. The union between León and Castile was never accepted by the Leonese people. King Ferdinand III needed 2 years to suffocate the secessionist revolts in the Kingdom of León, so his son Alfonso X restored the independence of the Kingdom of León. However, this was not respected by his successor Sancho IV. His brother John waited until 1296, following Sancho's death the previous year, to be crowned as John I, King of León, Galicia and Sevilla. In 1301 he abdicated and the king of Castile assumed the Crown of León, reuniting the two kingdoms. Though the kings of Castile and León initially continued to take the title King of León as the superior title, and to use a lion as part of their standard, power in fact became centralized in Castile, as exemplified by the Leonese language's replacement by Spanish. The Kingdom of León and the Kingdom of Castile kept different Parliaments, different flags, different coin and different laws until the Modern Era, when Spain, like other European states, centralized governmental power. 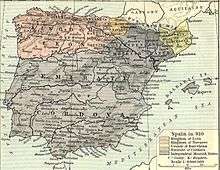 The Kingdom of León coexisted as a personal union under the Crown of Castile, with León possessing separate institutions, such as its own cortes, the Real Adelantamiento of the Kingdom of León, the Merino mayor of León, among others, many of which lasted until the 19th century. The Castilian monarchs, however, soon began a process of unifying the laws of the two kingdoms, as exemplified by the Siete Partidas. By the 16th century, León became a captaincy-general. In the 19th century, the Kingdom of León declared war, together with Galicia and Asturias, against France, and organised the Junta General del Reino de León as its own government. The modern region of the Kingdom of León was established in 1833 and was divided into León, Zamora, and Salamanca provinces. At present, León is composed of the provinces of León, Zamora, and Salamanca, is now part of the autonomous community of Castile and León within the modern Kingdom of Spain. Political parties representing "Leonesismo", the Leonese regionalist and nationalist movements, support the creation of an autonomous community separate from Castile. Leonesist parties gained 13.6% of votes cast in the León autonomic elections in 2007. There have also been initiatives approved by some Leonese city councils to establish a NUTS-2 (European Statistical Region) for León.